Only eleven houses remain occupied in Baishizhou’s Tangtou row houses. Nanshan District tacitly condemned these houses several years ago, but did not become serious about evictions until the Universidade (Summer 2011). As inhabitants were evicted, the District padlocked the doors, so that the buildings could not be reoccupied. However, as the saying goes, “Those on top have policies, those on the bottom have countermeasures (上有政策,下有对策)”. When houses weren’t immediately padlocked, another family or worker or group of friends moved in. The owners continued to collect rent. When enforcers from the Urban Management Bureau (城管) came by either the inhabitants moved, or made friends with them and stayed, waiting for the final eviction. Nanshan District has decided to close down the area completely because the summer rains further weakened the structures. These buildings from rural collectivism are no longer simply considered an eyesore, but also dangerously unsound. The vanishing of Maoist economic legacies was, of course, one of Shenzhen’s raison d’etre. However, Maoism lingered in the nooks and crannies of previously built spaces, such as Tangtou. Indeed, the Tangtou row houses are one of the few remaining examples of Maoist architecture in Shenzhen’s inner districts and once they have been razed, Maoism will become more of a spectre than it already is. Thought du jour: in Shenzhen, even crumbling, Maoist dormitories can no longer safely shelter the city’s poorest workers and their families. Wither the left, indeed. Impressions of Tangtou wet and sunny, and still occupied interior. 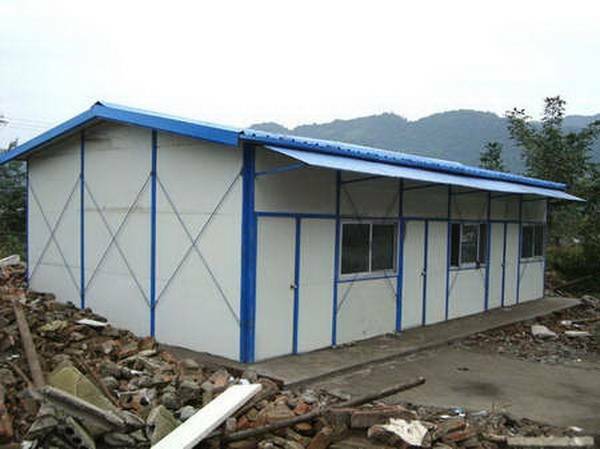 One of the most common sights sites in Shenzhen — the prefabricated, movable dormitory. Of note, although almost half of sales are domestic, nevertheless the “Chinese standard” is being profitably exported throughout South America, Southeast Asia, Africa, Oceania, and the Middle East. It is of note du jour because I just realized that this is one of the primary housing typologies for workers. Moreover, it serves the purposes of urban rennovation without leaving housing stock for more permanent working class neighborhoods. That said, one of the other uses of prefabricated houses is building suburbanesque working class neighborhoods in the United States and Japan.